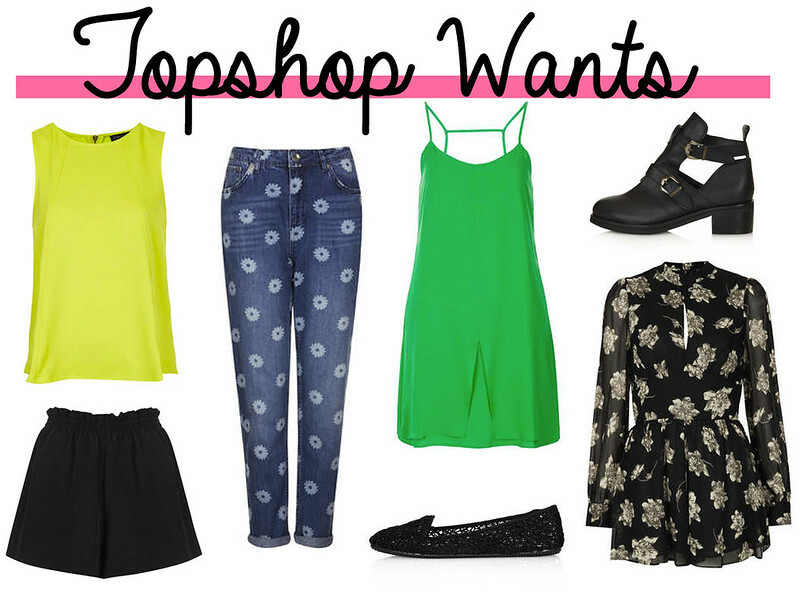 It feels like ages since I made a Topshop wishlist as I haven't really been loving Topshop as much as I used to. I still like Topshop and love some of the pieces it sells and so here's my latest wishlist of must haves in-store and online at Topshop at the moment! Floral Playsuit - £50 I love this lime green/yellow colour and think it's absolutely gorgeous! I love how it looks amazing with black! Especially leather shorts, silk shorts, a skater skirt or disco pants! I think these daisy mom jeans are amaaazing! I love how they have such a lovely print and really do stand out! I am still a massive fan of the slip dresses which Topshop do but I haven't added one to my wardrobe yet! I am obsessed with flat black shoes at the moment and cut out boots! I think cut out boots are the style essential for every girl/woman's wardrobe this season! I know what you're thinking this playsuit is a little on the expensive side but how gorgeous is it?! been obsessing over that playsuit all weekend, definitely a pay day buy for me! Loving the post. Thanks! I've been off the blogging bandwagon for ages. So I haven't been using my dashboard to keep updated! I want those cut out boots. The playsuit would be so nice for a night out!